Kids come join us as we partner with Dilly Dally, a local whimsical art studio offering wooden cutout designs. 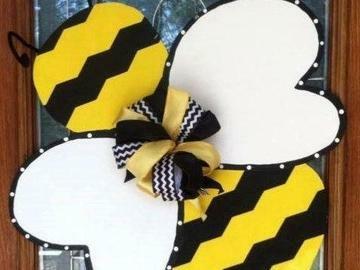 You will choose from Spring wooden cutout/door hanger designs to paint. Cost is $16.05 ($15 plus tax) per person which includes your design to paint, refreshments and beverages from Patterson Farm Market & Tours, Inc. and lots of fun memories. You must pre register for this event. Berries and Blooms Festival Weekend Admission is not included with this event. Designs to choose from include Butterfly, Cupcake, Ice Cream, Flip Flops, Cow, Pig, Bumble Bee, Flower, Tractor and of course, a Strawberry! Recommended for ages 4 and up. Please note cutout pictures are a sample of the cutouts. Actual cutouts may not be exactly as shown.